Starting Oct 29 (i.e. this week), we’ll begin our weekly Dominion Rewatch. So get your DVDs, Blu-rays and DVRs ready to relive all 21 episodes of the show. We will gather every Thursday at 10/9c and “live” tweet about the show, hoping to not just have fun, but also raise awareness for Netflix to possibly pick up Dominion. So when you tweet with us, don’t forget to (only!) 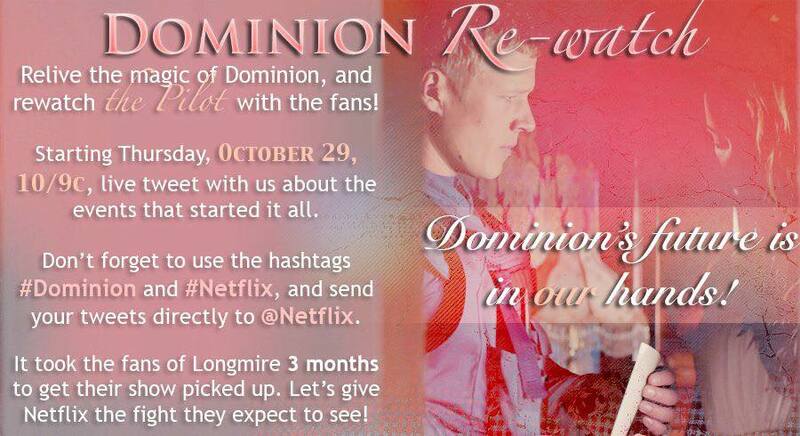 use the hashtags #Dominion and #Netflix, and send your tweets directly to @Netflix as well. What we’ll need now is not just a little bit of luck and a whole lot of determination, but also stamina. Pickup decisions aren’t made in two weeks. It may take months for a network to announce picking up a cancelled show. We may need to make a little more noise before then, so let’s go do it. If you’d like to keep up with the rewatch, we have an Upcoming Events widget in our sidebar now that lists the events we have planned. Alternatively, you can also just go to our Google Calendar and track our activities there. Now that Syfy has cancelled Dominion, we want to get the show on Netflix’s radar to give it a chance to live on. From October 18 to 24 (Sun through Sat), we will be having daily half hour-long tweetouts – every day at 10 AM and 10 PM EDT. 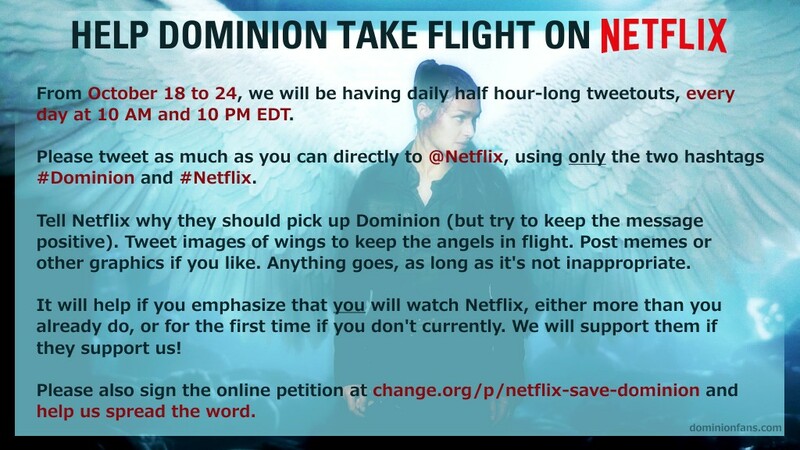 Tell Netflix why they should pick up Dominion (but try to keep the message positive). Make it clear to them that we want a new season of Dominion produced by Netflix (don’t just ask for them to carry Dominion — we don’t want them to think we mean Seasons 1 and 2 only). Tweet images of wings to keep the angels in flight. Post memes or other graphics if you like. Anything goes, as long as it’s not inappropriate. It will help if you emphasize that you will watch Netflix, either more than you already do, or for the first time if you don’t currently. We will support them if they support us! Please also sign the online petition if you haven’t already. Let’s spread our wings and light the spark for Netflix to help us out! Dominion cancelled — Where do we go from here? The worldwide fandom of Dominion is shocked and saddened by Syfy Channel’s business decision to cancel the series after just two seasons. At this difficult moment our first priority remains the same: demonstrating our unwavering support for and appreciation of the amazingly talented creative team, cast, and crew of Dominion, and our fellow Angels. The admins of the Syfy Dominion’s Angels Facebook group and Dominionfans.com are united in their desire to seeing the story continue, either on another channel or via some other media. We also ask fans to continue to support Vaun Wilmott, the cast and crew in all their future endeavors. As we work together to discuss possible plans of action, we ask that you keep the message positive and looking toward the future. Please continue to tweet out your love and support to all members of the Dominion family using ‪#‎Dominion‬. You can also sign this online petition to support the show getting picked up by Netflix. If you have not already done so, join the Syfy Dominion’s Angels Facebook group, follow @Dominion_Fans on Twitter, and check Dominionfans.com often. We will announce our plans soon, using all three platforms. Episode 2×13, the season finale, aired last week, so please add your user rating on IMDb, TV.com and SpoilerTV. Updates on the official Syfy website: Inside Dominion’ for episode 2×13, photo recap for episode 2×13, and more recap videos from episode 2×13 in the video section. Dominion: Revelations has chapter XIII (the last one) now activated. It’s about Helena, the City of Women. 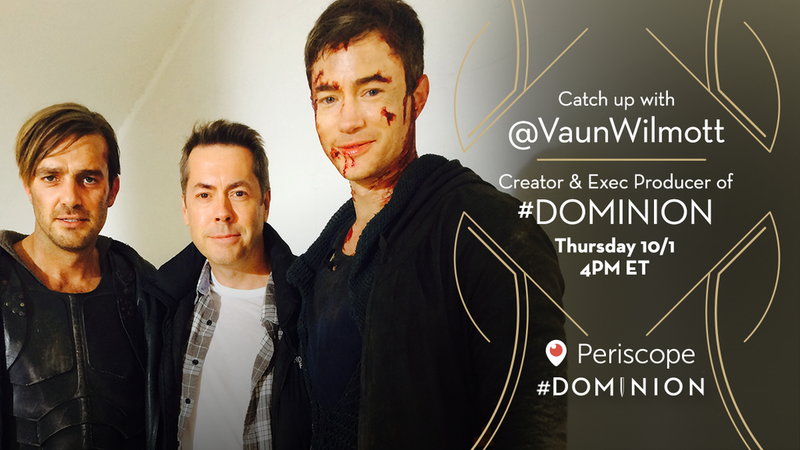 Vaun Wilmott did a Periscope chat last Thursday before the finale. You can watch the video on YouTube to catch up with all the questions and answers. There’s new print interviews with Vaun on TV Insider and TV Line where he talks about the season finale and what might be in store for a possible season three. Metro has a new interview with Anthony Head. Of if you like the show’s music, read the one with composer Bill Brown. Halona Holmes has recently uploaded a bunch of new Dominion fanvids. Some of them use official tracks from the show by Bill Brown. Check them out on her YouTube channel. Please keep supporting the show by letting Syfy know how much you love the show and would like to see a third season.